A purist tile or color? 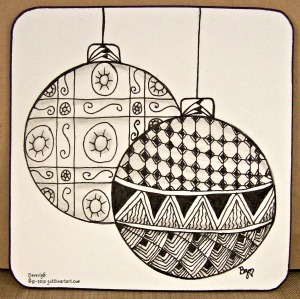 A black and white beauty or colorful Christmas baubles? Finally, I settled on the black and white of the original Zentangle concept. The left ornament is TA-SF and Betweed. The right ornament is Betweed, Knase, Florz, and Flukes. After so much indecision I'm pretty pleased with the outcome of my efforts. If you visit here tonight be sure to come back tomorrow afternoon and click the link to see the new weeks challenge.